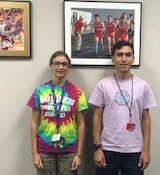 Congratulations to Goshen High School seniors Felix Perez Diener and Katherine Shirk who were recently named as National Merit Semifinalists! Today officials of the National Merit Scholarship Corporation (NMSC) announced the names of approximately 16,000 Semifinalists in the 64th annual National Merit Scholarship Program. These academically talented high school seniors have an opportunity to continue in the competition for some 7,500 National Merit Scholarships with more than $31 million that will be offered next spring. To be considered for a Merit Scholarship award, Semifinalists must fulfill several requirements to advance to the Finalist level of the competition. Over 90 percent of the Semifinalists are expected to attain Finalist standing, and about half of the Finalists will win a National Merit Scholarship, earning the Merit Scholar title. Again, congratulations to Felix Perez Diener and Katherine Shirk. Well done!